The brethren of St. David’s Lodge No 2950 were delighted to welcome, as principle guest to their installation meeting, Assistant Provincial Grand Master Derek Parkinson. The meeting was held at the home of the Garston Group, Garston Masonic Hall. Derek Parkinson (left) congratulates Hughie O’Neil. Derek was accompanied by Garston Group Chairman John Murphy and group vice chairman Dave Atkinson, together with regional charity steward Paul Shirley. With the regular installation meeting having to be postponed, due to the master elect being obliged to withdraw, because of family and business commitments, the incumbent WM Hughie O’Neil, willingly agreed to continue in office for another year. Following the reading of the necessary dispensation and completion of routine business of the lodge, lodge DC Ken Bradley announced that Derek was without and demanded admission. Hughie duly welcomed Derek into the lodge and greeted him and all the visitors, expressing his wish that they all enjoy the evening’s celebrations. The next business of the evening was to proclaim Hughie as the WM for the second year in succession. 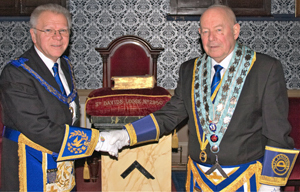 The ceremony was undertaken by the lodge DC Ken Bradley, with his customary calm assurance and dignity. Ken also undertook the presentation of the working tools in each of the respective degrees. Hughie then invested the officers of the lodge for the ensuing year, before Derek completed the proceedings by delivering the address to the brethren of St. David’s Lodge. At the conclusion of the ceremony, Derek stood to convey the best wishes of the Provincial Grand Master Tony Harrison, who had asked Derek to congratulate Hughie on continuing in the master’s chair. Derek went on to say that had Tony been present he would no doubt have offered his congratulations to Ken, for all his work during the evening. With the ceremony completed, Derek retired from the room and the lodge concluded their remaining administrative business. The brethren later gathered to celebrate and toast the newly proclaimed WM, in our unique West Lancashire fashion, before enjoying a well deserved festive board. Pictured from left to right, are; Paul Shirley, Derek Parkinson, Hughie O’Neil, John Murphy, Dave Atkinson and Ken Bradley.